Off-the-grid living is becoming more and more popular for a wide variety of reasons, whether they be social, political or simply financial. Being self sufficient, and not beholden to a water or electrical company provides freedom. What started as simply a movement to disconnect from the power supply, has evolved into something far broader, and off the grid living now often means being completely self sufficient without relying on (or at least a very minimal reliance on) public utilities. Basically no bills once it’s built! Statistics are hard to come by on sustainable living off grid, but it could be up to 1.7 billion people who may live off-grid worldwide. Whether it is by choice or necessity, a second hand shipping container can provide the best start to an off-grid living project. But why? 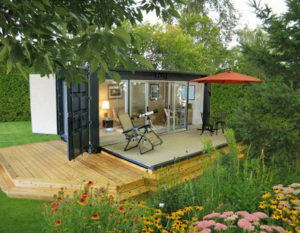 Shipping containers can be the ideal start for your off-grid living. They’re cost effective, available everywhere, stackable, scaleable and easy to transport. They can be easily cut and modified any way you want – perfect to build your own house. The COST is so much smaller than buying all the building materials for a house, therefore much more effective. They are able to be TRANSPORTED anywhere, on any form of transport. They’re able to be SCALED to any size house you want – easily stacked to any height. 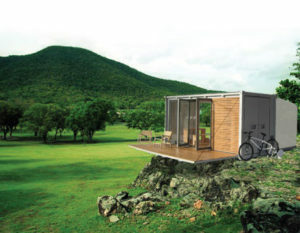 Just like giant blocks, shipping containers can be assembled and locked together to create a simple MODULAR home. The ease of which they can be MODIFIED is what makes containers second to none to use as building materials – inserting a door, window, plumbing or electrical fit outs can easily done DIY. By not using precious resources and recycling a container otherwise sent to a waste yard, shipping container construction becomes environmentally friendly and SUSTAINABLE. Totally Off Grid means your need to have a form of power generation. Usually the best option is to use locally available renewable energy. The options here are solar power, wind generation, wave or tidal generation, hydroelectric power or geothermal, with solar power being the easiest to set up. Other options are less environmentally friendly, such as using an available diesel generator, but costs can easily mount up if you end up using a lot of fuel. The major problem, however, is that you must use the energy as you produce it, and there are very few options for balancing the load or storage as high capacity batteries are large, heavy and expensive. Hopefully this will change shortly – with different companies such as Tesla Motors creating power bank that takes energy generated during the day (when most people are out of the house and not using power – apart from air conditioning and refrigerators) from solar panels and allows it to be used when there is peak demand – balancing the load more effectively. While not available world wide just yet, it’s only a matter of time before similar products are available for the average person. So once you’ve got your fully sustainable, off-grid power supply worked out the next thing you’ll need to address is how you’ll get and dispose of your water and liquid waste products both safely and legally. This is all going to depend on where your off-grid container home is located, if you are near a spring or a source of groundwater (where you can drill a well). If you are located somewhere where there is a decent amount of rain, then rainwater may be a solution. You’ll want to ensure that you live nowhere near major sources of pollution such as factories or highways. Rainwater can be collected from roofing via gutters and stored in a large tank or cistern. After collection, all water will need to be filtered to human drinking water standards to ensure that it is safe to consume, though if the water is simply for washing, this may not be required. Getting rid of waste water and other sewerage is slightly more complex. There are a few ways to do this, but the most common options generally are composting toilets or a septic tank system. You will need to check with local government regarding regulations for septic tanks, while legal in some areas, others will be banned or at least heavily regulated. Septic tanks collect wastewater, and allow bacteria to break down waste material before releasing it, while composting toilets use a special design along with wood chips to turn waste material into a compost type material. Some people use this on gardens, while others warn of risks associated in doing so – it should never be used on any gardens used for food production. These both need to be installed and professionally maintained, and special care should be taken to ensure that any products used are environmentally friendly and suitable for a septic or composting system. Installing a fireplace can be a good idea even though it is a little environmentally unfriendly unless you have a ready supply of sustainable timber nearby. For cooking, a gas hob is ideal. Simply set up a system where a gas bottle, similar to one in your BBQ, is located in a protected cover outside of your kitchen area and a hose is plumbed into your gas stove. Keep a spare cylinder full at all times and refill your cylinder whenever you go back into town for petrol. By using a gas stove rather than an electrical one you will reduce the load on your power system when it comes to cooking time, or if you want to keep a standard element consider getting one that is split between gas and electrical powered. That way even if you are low on power, you can continue to cook. A container home designed for on- or off-grid living is the Ecopod. Made from a shipping container, an electric winch is used to raise and lower the heavy deck door (power is supplied by a solar panel). The floor is made from recycled car tires, and the walls have birch paneling (over closed-cell soya foam insulation). The glass is double paned to slow heat transfer – and it can be used as a stand alone unit or with other structures. It is designed to minimize environmental impact. The Port-a-Bach system from New Zealand’s Atelier Workshop might be a good fit for anyone looking to go offgrid – it sleeps two adults and two children comfortably, in a dwelling that folds up into a fully enclosed steel shell. The home comes with large internal storage cupboards and shelves; a stainless steel kitchen; bathroom with shower, sink and composting toilet; bunk beds and dressing room. Fabric screens allow you to shape internal space, as well as shelter the outdoor deck area. The All Terrain Cabin (ATC) is based on a standard shipping container, and is said to be suitable for a family of four, plus a pet, to live off the grid in comfort and style. 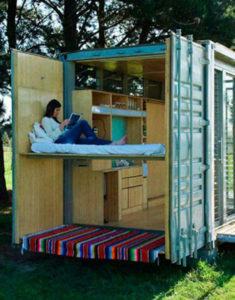 The cabin folds up to look like any old shipping container, and can be sent via rail, truck, ship, airplane or even helicopter. When you’re ready to rest your bones, the cabin quickly unfolds to 480 square feet of living space, with a range of creature comforts.